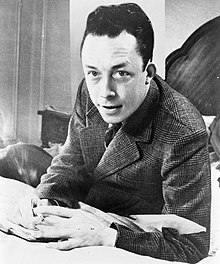 In 1941, Camus wrote his first novel, which was called The Stranger. During World War II, Camus joined the French Resistance to fight against the Nazi army. After World War II, Camus became friends with another writer named Jean-Paul Sartre. Camus and Sartre often talked about philosophy and politics in small restaurants called cafés. ↑ Lennon, Peter (15 October 1997). Camus and His Women. Guardian. UK. Archived from the original on 7 December 2008. Retrieved 1 December 2008. This page was last changed on 14 February 2019, at 01:39.